My work days are usually filled with 2 sorts of tasks - computer work (mainly designing and writing patterns) and studio time. The studio time often takes a 'back seat' to the design and writing time unfortunately. I tell myself each Spring that 'this will be the summer to sew' but progress is often slow. Don't you sometimes wish there were more hours in a day. I have made progress on a new pattern to be released this fall. I was asked by Island Batik to create a pattern using their upcoming fabrics. I selected a holiday red and green collection (Holly Jolly) and a winter blue collection (Frost) to make an updated version of a Give & Take Applique pattern. 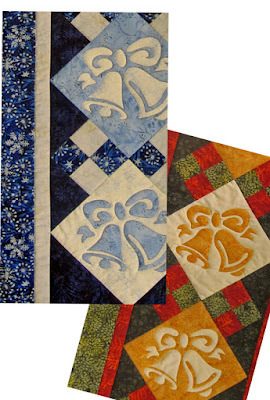 Here's a sneak peak at the banners for the Holiday Bells pattern that will be available in October. They are on their way to California to be photographed for the Island Batik Fall wholesale catalog. I always announce publication of new patterns first in my FREE newsletter (and newsletter subscribers always get 10% off all pattern orders). So....why not subscribe to the newsletter while you are here. The place to subscribe is on the right, at the top of this page. I never share your email address with anyone and you won't be flooded with emails from me. Just once every couple of weeks you'll get a brief note about what's happening in my studio and my life. I often include product reviews and other informative information. As a BONUS, you'll receive a free pattern as my thank you right away. What are you working on for the summer? Any large projects or some of your UFOs? Have you made a quilt using a Patchworks Studio pattern or a project in a workshop with me? I'd love to share your photos so email your pictures to me.